I know I can always count on Timeless Romance for a delightful, clean romance that I can get through in a weekend. 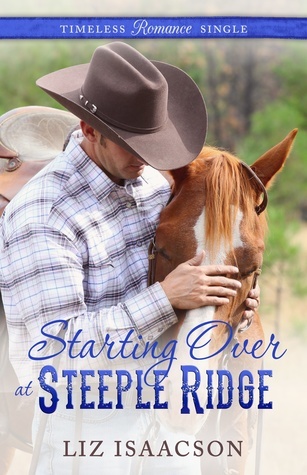 Starting Over at Steeple Ridge was just that. Liz Isaacson has crafted a sweet story that will pull on your heartstrings and leave you with a smile on your face. Missy is devastated that her beloved Steeple Ridge has been sold to some rich city slicker. Not only did her ex-husband leave her with debt and emotional scars, but now her dream of owning the horse farm is forever out of reach. The fact the new owner makes her pulse race only complicates matters. Tucker wants nothing more than to escape the city. His jet-set lifestyle left him feeling unhappy and unfulfilled. Moving to a tiny town in Vermont and buying a horse farm, even though he's never even been on a horse, seems the perfect solution. Even though Missy and Tucker are seemingly opposites, they quickly learn how to work together and find that the attraction is mutual. Neither is looking for a new relationship. Both have things in their pasts they'd like to keep hidden. Both need a new beginning. Sweet western romance that even a city slicker can enjoy.